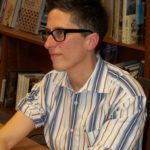 Alison Bechdel is an American cartoonist. Originally best known for the long-running comic strip Dykes to Watch Out For, she came to critical and commercial success in 2006 with her graphic memoir Fun Home, which was subsequently adapted as a musical which won a Tony Award for Best Musical in 2015. She is a 2014 recipient of the MacArthur “Genius” Award. She is also known for the Bechdel test. "But mostly, it’s a book about my relationship with my father." "And partly, the worst thing you could do in my family was need something from someone. So physical strength represented an avenue of self-sufficiency to me." "I hope that I can get people to read it without having to change it. Especially now that the strip has more different kinds of characters. It’s really not all lesbians any more."